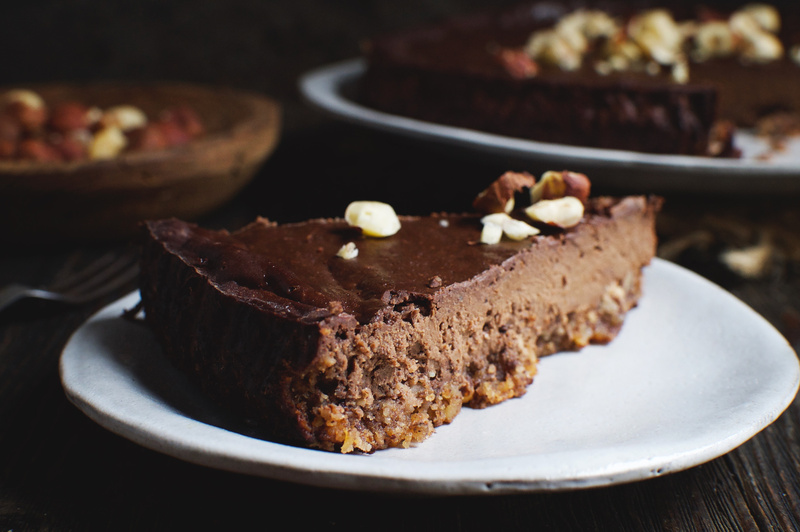 This creamy Low-Carb Chocolate Hazelnut Fudge Pie tastes like Nutella. This decadent dessert can work for low-carb, keto, Atkins, LC/HF, gluten-free, grain-free, or Banting diets. 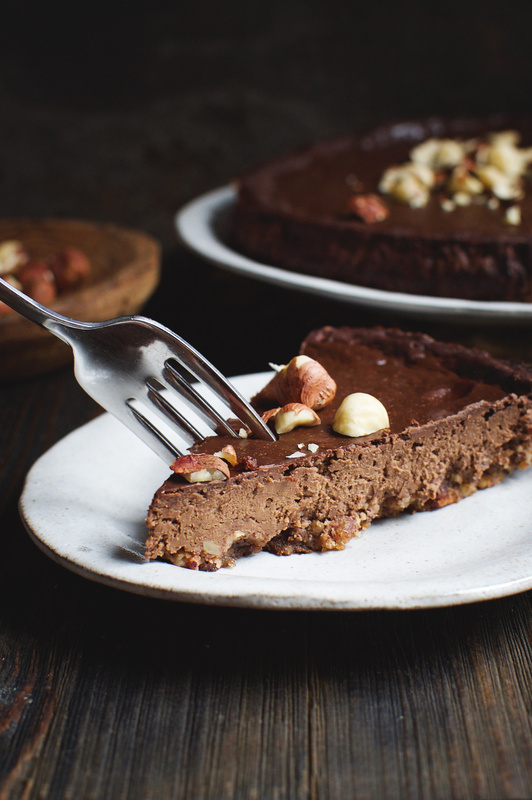 This Low-Carb Chocolate Hazelnut Fudge Pie boasts a toasted hazelnut crust. The nutty goodness is covered with a thick layer of rich fudge-like chocolate. A scattering of hazelnuts on top adds the crowning glory. 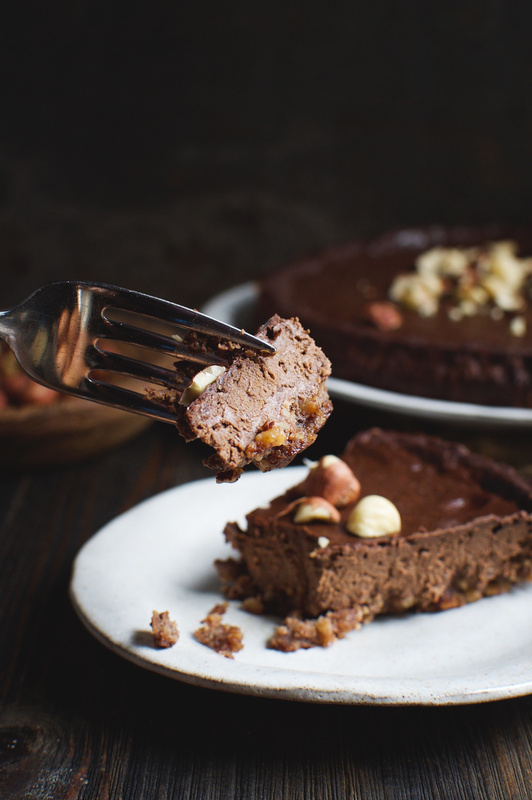 One bite of this pie fills your mouth with rich chocolate and hazelnut flavors reminiscent of Nutella. This pie began as an accident. I love the flavor of chocolate and hazelnuts together. This flavor combination makes a dessert match that’s better than chocolate heaven. 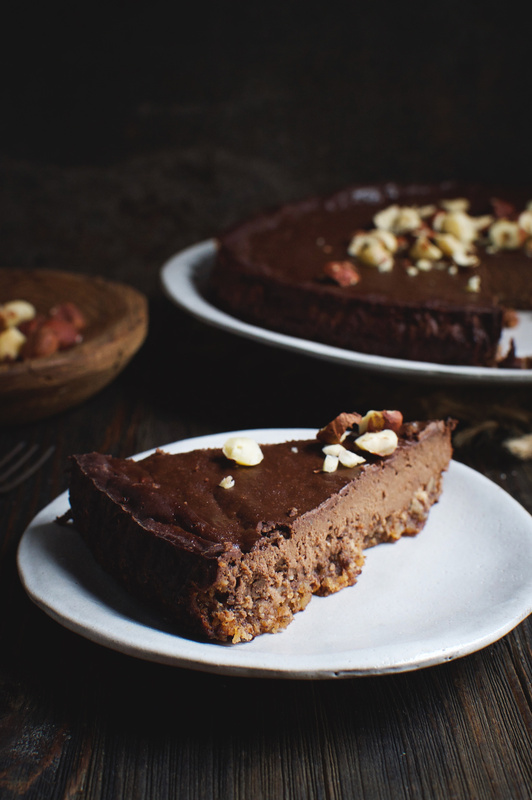 I decided to put this combination to use and make a chocolate custard pie with a hazelnut crust. What came out of the oven wasn’t what I had imagined. Instead of a custard pie, I ended up with a fudge pie! While a fudge filling wasn’t what I was looking for, it was even better than what I imagined. I decided to work with it! After a few variations of the recipe, I came up with this version. It’s remarkably easy to make. The crust is made with the press of a button on a food processor. While the crust bakes in the oven to bring out the toasted hazelnut flavor, the filling can be made by melting the chocolate in some cream, then mixing it in with a few other ingredients. The whole thing is then baked in the oven. So easy! The quality of the hazelnuts used in this pie can make a big difference in the final product. I’ve had a little trouble finding hazelnuts this year. The grocery store closest to me didn’t have any. Another store I used had chopped ones from a common brand packaged up in small over-priced bags. I made the pie once from these and I wasn’t happy with them. They tasted a little stale. I finally went to Trader Joes and they had big bags of fresh tasting hazelnuts. These nuts made the pie sing! This pie ends a holiday meal with chocolate perfection. However, why wait for a holiday? 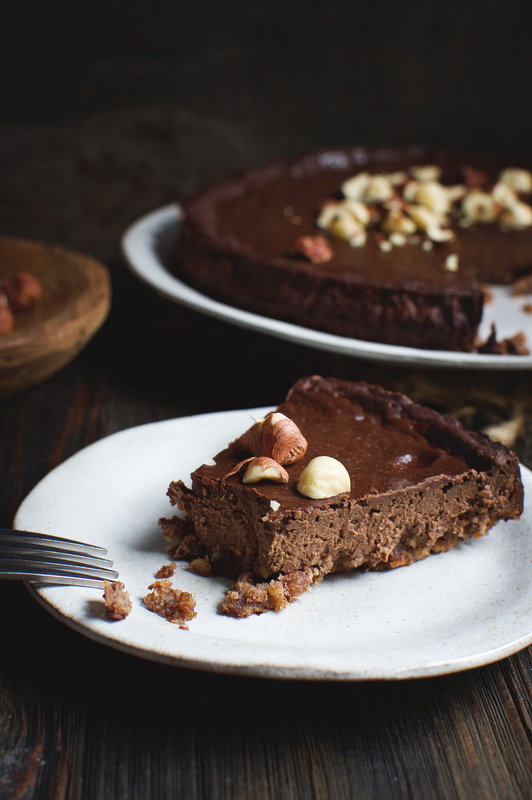 This pie makes it easy to treat yourself to a delicious chocolate-hazelnut goodness anytime! Enjoy! Preheat oven to 375º Fahrenheit. Line the bottom and sides of a 9" springform pan with parchment paper. Pour filling over the baked hazelnut crust. Bake pie in the preheated 300º Fahrenheit oven for 60-80 minutes. or until set. The filling will still jiggle at this stage, but will solidify as it cools. Don't over-bake as this will make the filling dry and hard. Hi Ladies!! I’m out of swerve at the moment and was wondering if a liquid sweetener might work here or does the filling need the sugar likeness of the swerve to harden or crystallize for the filling? Beautiful recipe!! I really enjoy your site!! Thanks for your kind words! I feel like this recipe needs the bulk of the erythritol to work. I usually use Pyure which I can find at Walmart, Whole Foods, or Amazon. Pyure is twice as sweet as Swerve, so the recipe may not turn out quite the same if you use Swerve. You would need to use twice the amount for the same sweetness level. This could affect the texture, but I’m not sure to what extent. Good luck! I made this today but when i calculated all the ingredients on my keto app it gave me 18 net carbs per serving (if using 12 servings). I calculated it several times and came up with the same. I used the exact same sweetener (pyure) and the 2/3 cup alone is 128 net carbs for the entire pie. How did you arrive at only 6 net carbs per 1/12th of a pie? All my other calculations came out the same as yours i.e. the fat, calories and protein. Could you clarify how you figured the sweetener? You app probably calculates sugar alcohols as carbs. I do not do this for erythritol since it passes through the body without being metabolized. According to this study any erythritol that is ingested is almost completely recovered in the urine. This means that the body did not use it. This is not true with all sugar alcohols. I hope you enjoy the pie! Hi, I am a little confused by sweetener amounts. Could you please clarify amounts (is it 1 Tbs struvia, or a 1/2 cup of sweetner or a 1 cup of sugar?) Can you use regular sugar? Thanks! For the sweetener, I use 1 tablespoon Pyure (a stevia/erythritol blend) for the crust and 2/3rds cup Pyure for the filling. I included the sweetness level compared to sugar in case people wanted to make substitutions. If you want to use regular sugar, you will need to use twice as much sugar as I used of Pyure. Of course, the recipe will no longer be low-carb if you use regular sugar. I haven’t tried their hazelnut flour. I assume it’s just ground up hazelnuts, so I don’t think it would give it a bad taste as long as it’s fresh. Oh my gosh!! This is amazing. Thank you so much for the fabulous recipe. I’m so glad you enjoyed it! I was just thinking about making it today. I love chocolate and hazelnuts together! Could this be done with full fat coconut milk in place of the heavy cream? It looks delicious, but I can’t handle that much dairy. Butter is fine, but the heavy cream is a no go for me. This recipe can be a bit “fussy”. While I would think substituting coconut milk should work fine, I hesitate to give you a definitive answer because I haven’t tried it and the recipe is more sensitive to changes than a lot of others. If you do try, use the thick stuff out of a can. I only can get unshelled hazelnuts here. do I need to remove the shins that are under the shell before grinding them? The ones I use have a papery brown coat on them and some of them come off and some don’t Hope this helps! Could I add some hazelnut butter in the filling? So it tastes like Nutella? I want to use Swerve since that’s all I have.Whst exactly does this mean? So how much Swerve do I need to use? I have both granulated and confectioners. This is taken from your instructions above. Sorry about the confusion. Double check on you Swerve package, but I think it measures cup for cup like sugar. If this is the case, you’ll need to double the amount of sweetener. Either granulated or confectioners will work, but confectioners will dissolve a bit better. Good luck! Thanks so much for noticing that I mentioned Truvia. I must have had a brain fart that day. I do, indeed, use Pyure in this recipe (also available at Walmart here in the States). Pyure is twice as sweet as sugar, so be careful with making substitutions as many are the same sweetness as sugar and the quantity would need to be doubled. This recipe should work with other sweeteners as well. The only issue I foresee is that if you use a whole cup of an erythritol blend, the erythritol may crystalize a bit. What sweeteners do you have available there?